In this study, it is investigated that the Schur stable difference equation systems $y(n+k)=Cy(n)$ under which perturbations remains Schur stable. Some continuity theorems of the first order systems in the literature are re-expressed for the $k-th$ order system $y(n+k)=Cy(n)$. All the results obtained are also supplemented by numerical examples. Akın, Ö., Bulgak, H.,Linear difference equations and stability theory, Selc¸uk University, Research Center of Applied Mathematics, Konya(in Turkish), 1998. H. Bulgak, Pseudoeigenvalues, spectral portrait of a matrix and their connections with different criteria of stability. Error Control and Adaptivity in Scientific Computing, NATO Science Series, Series C: Mathematical and Physical Sciences, in: Bulgak H and Zenger C (Eds), Kluwer Academic Publishers, Vol: 536 (1999), 95-124. Godunov, S. K., Modern aspects of linear algebra, RI: American Mathematical Society, Translation of Mathematical Monographs 175. Providence, 1998. A.Duman and K. Aydın, Sensitivity of Schur stability of systems of linear difference equations with constant coefficients, Scientific Research and Essays, Vol: 6, No. 28 (2011),5846–5854. A.Y.Bulgakov, An effectively calculable parameter for the stability quality of systems of linear differential equations with constant coefficients. Sib. Math. J., Vol: 21 (1980),339-347. A.Duman and K. Aydın, Sensitivity of Schur stability of monodromy matrix, Applied Mathematics and Computation, Vol: 217, No. 15 (2011),6663–6670. A.Duman and K. Aydın, Some Results on the Sensitivity of Schur Stability of Linear Difference Equations with Constant Coefficients, Konuralp Journal of Mathematics, Vol: 2, No: 2 (2014), 22–34. T. M. Apostol, Explicit Formulas for Solutions of the Second-Order Matrix Differential Equation Y00 = AY, The American Mathematical Monthly, Vol: 82, No. 2 (Feb., 1975)(1975), 159-162. H. Bulgak and D. Eminov D ,Computer dialogue system MVC. Selc¸uk J. Appl. Math., Vol: 2 (2001), 17-38 (available from http://www5.in.tum.de/selcuk/sjam012203.html). ISNAD Duman, Ahmet , Çelik Kızılkan, Gülnur , Aydın, Kemal . "Sensitivity of Schur Stability of the $k-th$ Order Difference Equation System $y(n+k)=Cy(n)$". 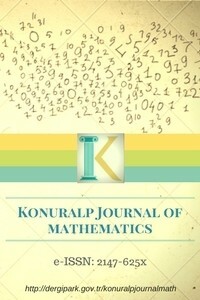 Konuralp Journal of Mathematics (KJM) 6 / 1 (April 2018): 98-101.